Miles Underwater - Day Two - the Ultimate Multitask - Colette Freedman is a top Hollywood Script Doctor who has also ghost written several novels. Our director made her day. And she did it while nursing her nine month old son. This pictures sings 1,000 words. It emblemates everything our team represents. Badass, powerful women… and a bunch of amazing men… making art and not letting anything stop us: Lack of money, 100+ degree heat and an infant’s need to eat. I make my living writing words; yet, they’ve managed to fail me when I think about what this picture represents. I guess if I could best sum it up in one word it would be hope. Hope that women CAN helm a feature film AND raise a family. They CAN pursue their dreams and pack school lunches. They CAN run a set with hope and grace and skill and badassery and breast feed. Our director, this unbelievable powerhouse has not only set the bar… she has hurdled high over it. Coming straight off producing two films: Quality Problems and And Then There Was Eve, Jen Prince has fluidly stepped into her role as director with focus, force and formidable talent. Personally, I have never met a person who can multi task as well as Jen. She truly “has it all” and “does it all” extremely well. Sure, there is collateral damage – mostly her lack of sleep; however, she delivers incredible productions… both personally and professionally. Today was the first day of Miles Underwater principal photography… and in addition to making our day, we got to see what our young stars were made of. We asked a lot of them: Running all over the stunning St. Mary’s campus, shrugging off the heat and delivering lines for wide shots, close ups and some extremely clever “Jen Prince shots”, and they delivered… again and again. Everyone stepped up. They had to. The success of independent films stems from a healthy combination of chutzpah, lack of ego and a collective determination. 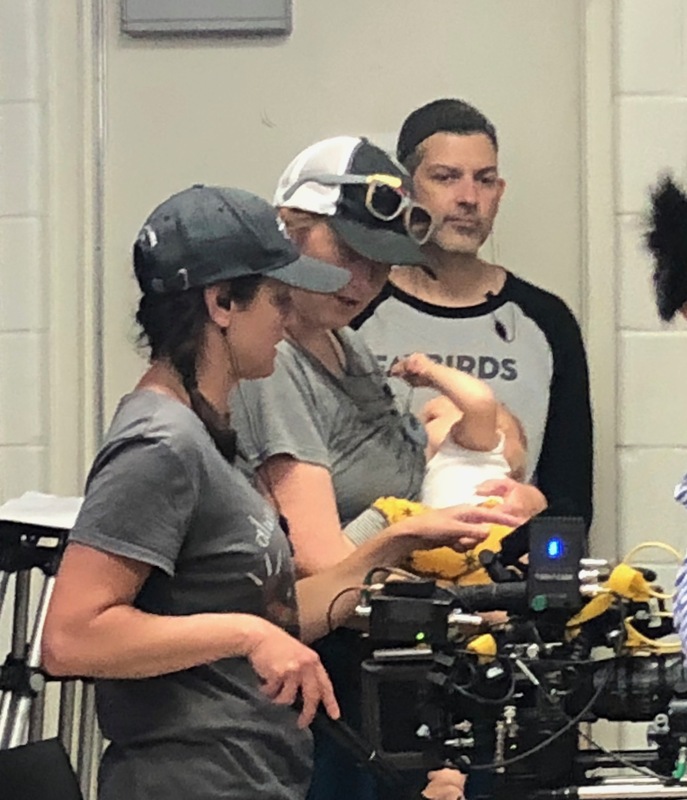 With our producers smiling through managed stress behind the scenes, an enthusiastic crew setting up shots with unprecedented speed and our entire core film repertory company doing everything from baby wrangling to bug spray shopping, everyone gave 1,000% effort. And our team does it through laugher, rolling with the punches and breastfeeding babies when they need to be fed.